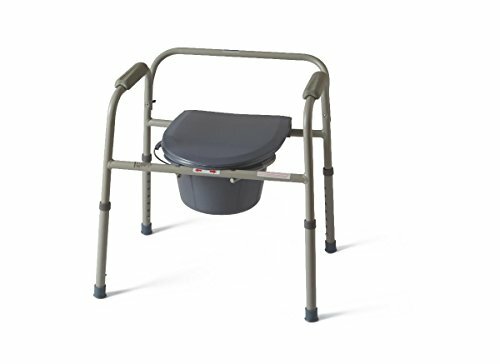 VERSATILE BEDSIDE COMMODE OPTION: Providing a convenient solution to meet the needs of a loved one or patient, the folding commode is lightweight and has a 7.5-quart capacity pail with a lid and splash guard. The handles provide a soft, nonslip grip for added stability. 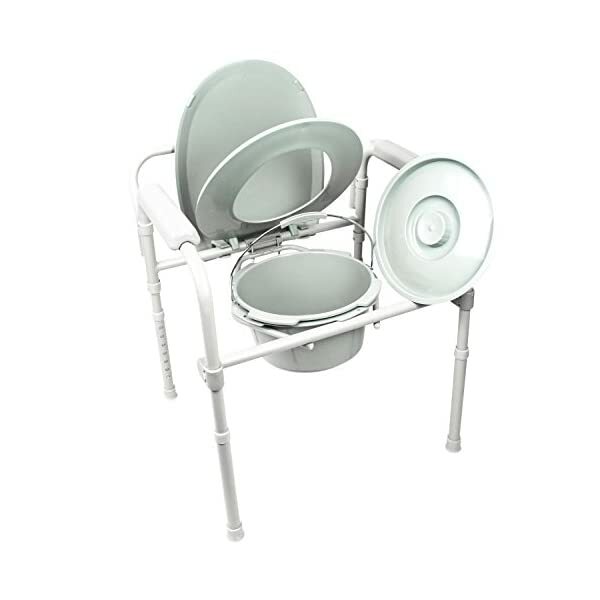 Can be used as a standalone unit, as a safety toilet rail frame or as an elevated toilet seat for an existing toilet and easily folds away for convenient storage and transport. Great for seniors and those with limited mobility. TOOL-FREE ASSEMBLY AND ADJUSTMENTS: Assembly is quick and easy, requiring no special tools. Each push pin audibly clicks into place to ensure safety and stability. Easy tool-free adjustments raise or lower the chair height to safely accommodate any individual. The leg height is adjustable from 14.5" to 20" for individual comfort. DURABLE NON SLIP DESIGN: Lightweight and corrosion resistant, the stainless steel construction provides a sturdy bedside option with a weight capacity up to 350 lbs. Each leg is tipped with a non-marking, non skid rubber cap for extra stability. The armrests are also covered with a soft, closed-cell foam for a comfortable and secure grip when standing or sitting. 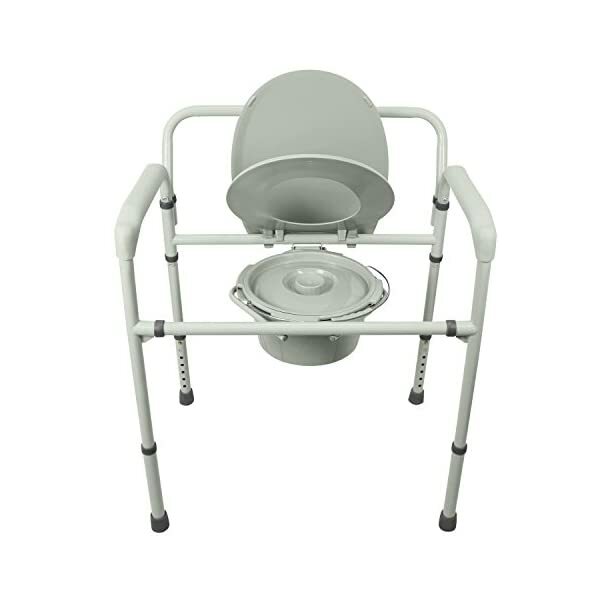 VERSATILE COMMODE OPTION: Providing a convenient solution to meet the needs of a loved one or patient, the bariatric commode is lightweight and has a six-quart capacity pail with a lid and splash guard. 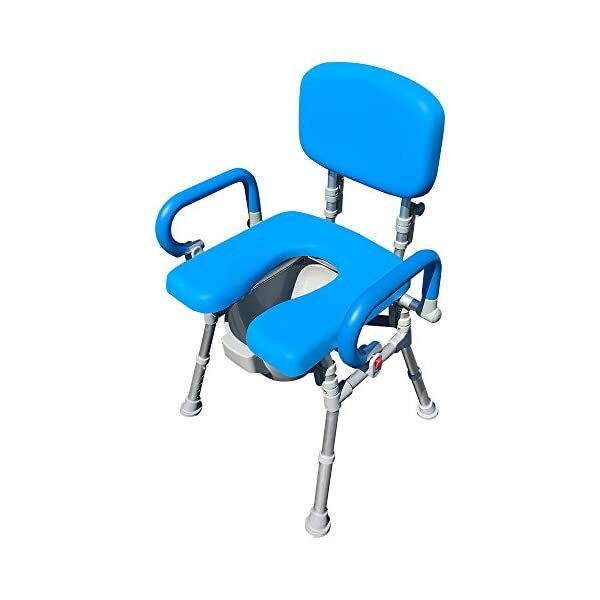 The commode chair can be used as a standalone unit, as a safety toilet rail frame or as an elevated toilet seat for an existing toilet and easily folds away for convenient storage. ARRIVES PRE-ASSEMBLED: Bariatric commode arrives pre-assembled for convenience. 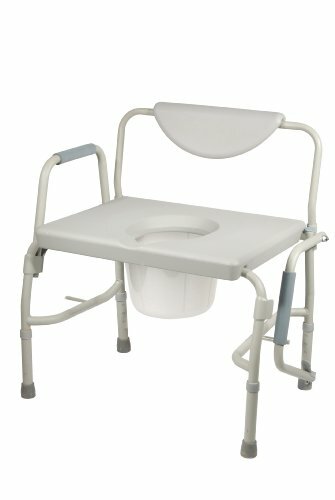 Tool-free height adjustments and a drop-in pail make the initial commode setup quick and hassle-free. EASILY ADJUSTABLE HEIGHT: Easy tool-free adjustments raise or lower the chair height to safely accommodate any individual. The leg height is adjustable from 14.5" to 20" for individual comfort. 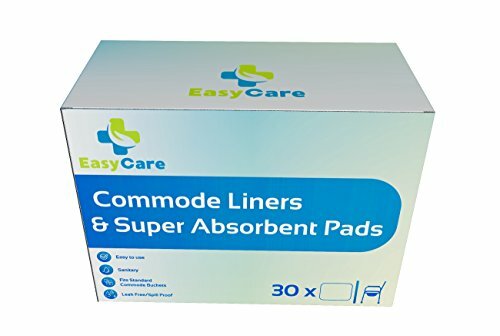 UltraCommode™ Voted #1 Most Comfortable Bedside Commode Chair- Soft, Warm, Padded and Foldable. XL Seat with 100% Open Front, Padded Pivoting Armrests, Adjustable Height. Free Commode Pail. EXCEPTIONAL COMFORT- Soft, padded, warm seat base, backrest and armrests makes the UltraCommode the worlds #1 most comfortable commode chair. Commercial grade PU foam will never absorb water, prevents sliding and is easy to clean and disinfect. CAN ALSO BE USED AS A SHOWER CHAIR! PROPERLY SIZED- Extra large seat is 16" x 16" and width between armrests is 20". 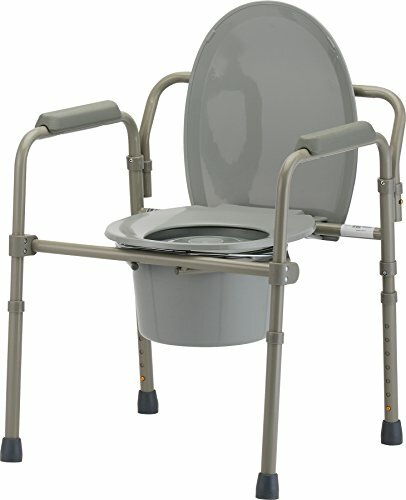 Compare these dimensions to competitive commodes- most of which are too small to be useful or comfortable. Carefully review the 1 star reviews of competitive products to avoid disappointment. SUPERIOR ACCESS- 100% open front allows for proper and effective wiping and cleaning. No metal bar or toilet seat in the way like old-style commodes. Unique pivoting armrests provide even more convenience as they can be completely swung back out of the way for more access to the body or for safer and easier transfers on and off the chair. Premium Quality - Carebag is medical grade & leak resistant. 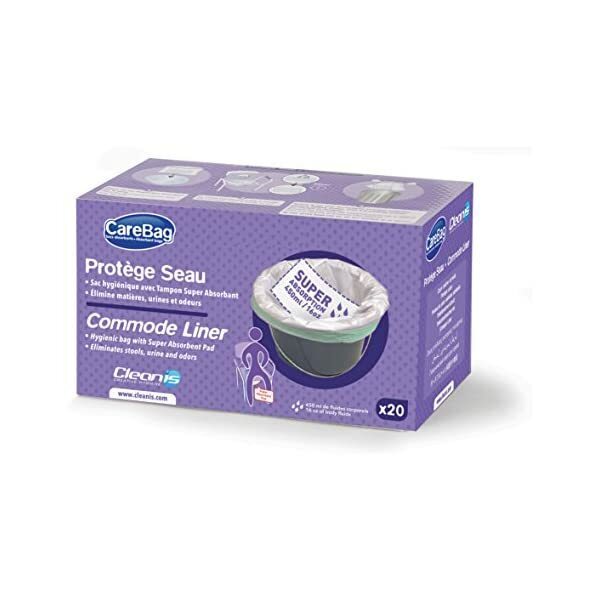 Say goodbye to "value pack" liners that leak! 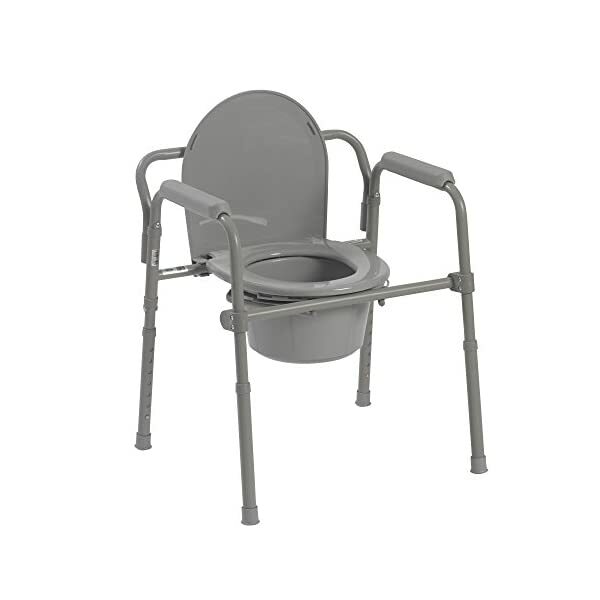 VERSATILE FOLDING COMMODE that can be used as a stand-alone toilet commode - by the bed, or over an existing toilet. Comes with splash guard, bucket with handle and lid for both options. ASSEMBLES IN MINUTES with no tools required. The frame, backrest, toilet seat and lid all snap into place. UNFOLDS IN SECONDS for easy storage. Great for portable use and travel. Legs are easy to adjust with push buttons to raise and lower the seat height.